Alfalfa, peanut, and soybean plants take in nitrogen and hydrogen from the air and turn it into ammonia, which helps the plants grow. The reactions to produce ammonia are driven by natural catalysts, which lower the energy necessary to make the reactions happen. Inspired by these catalysts, scientists uncovered how sunlight can kick start the functionalization of nitrogen molecules. They built a complex that harvests sunlight. The added energy causes electrons to shift and makes the nitrogen molecules receptive to bonding with hydrogen and, thus, on the pathway to making ammonia. Worldwide, farmers need nitrogen-rich fertilizer. Because of this need, researchers are striving to unlock highly efficient production of nitrogen-containing ammonia. Here, researchers explain how a complex's binding of nitrogen changes as it's excited by sunlight. The resulting insights could lead to catalysts that efficiently move electrons to produce ammonia using less energy. Also, the insights could lead to catalysts that use renewable sources of hydrogen, rather than natural gas. Ammonia in fertilizer is vital to growing crops. Producing ammonia for fertilizer is an energy-demanding process that requires natural gas to provide the needed hydrogen. Scientists have long struggled to synthesize a metal-based catalyst that can efficiently produce ammonia with a minimal carbon footprint because nitrogen is notoriously nonreactive. The goal is to develop energy-efficient processes that pump out ammonia using hydrogen from renewable sources. 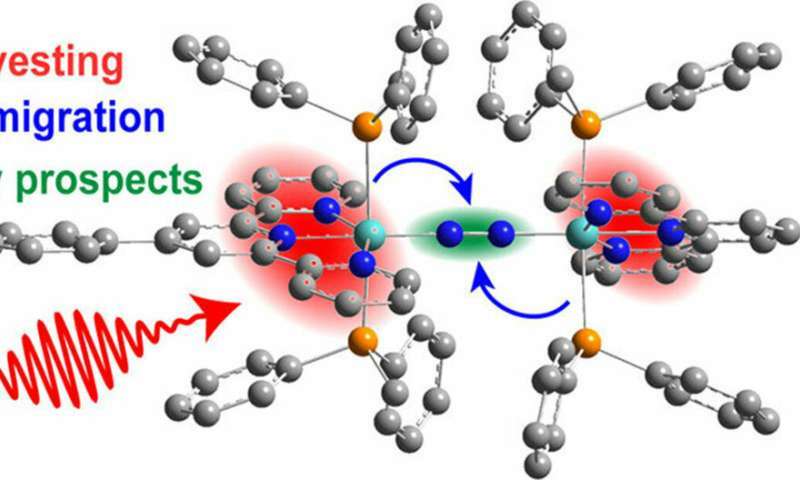 Now, researchers propose how a molybdenum-based compound can effectively use energy from sunlight to make nitrogen reactive and susceptible to forming the necessary bonds to create ammonia. The team prepared a complex that grasps a nitrogen molecule (dinitrogen) and holds it between two molybdenum atoms. Strand-like molecules attached to the metal center absorb light, specifically in the near infrared to ultraviolet range. In a fraction of a second, as light energizes the complex—and thereby supplies energy to convert nitrogen to ammonia—the light-absorbing molecules vibrate in synch with the nitrogen. This quantum-mechanical connection is hypothesized to lower the reaction barrier, thus making the nonreactive molecule receptive to bonding with hydrogen. Knowing how the electrons move and interact with the complex's structure could help scientists translate this work to catalytic nitrogen functionalization.